Marilyn Hedges on the John Wayne Pioneer Trail. Photo by Mike Sorensen (used by permission). Not many people in Washington know about the Channeled Scablands, created 15,000 years ago by an epic glacial flood sending water the equivalent of the five Great Lakes through Eastern Washington. 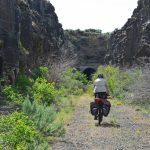 Fewer people yet know that the longest cross state trail in the country, the John Wayne Pioneer Trail (JWPT), winds through the heart of the Channeled Scablands. The JWPT starts at Rattlesnake Lake, near North Bend, WA and continues for 285 miles to the Idaho border. In those 285 miles it crosses the Cascades, high desert country, the Scablands and eastern Washington’s Palouse. The JWPT, the former Milwaukee Railroad, is a rail to trail jewel in Washington State’s growing network of trails. 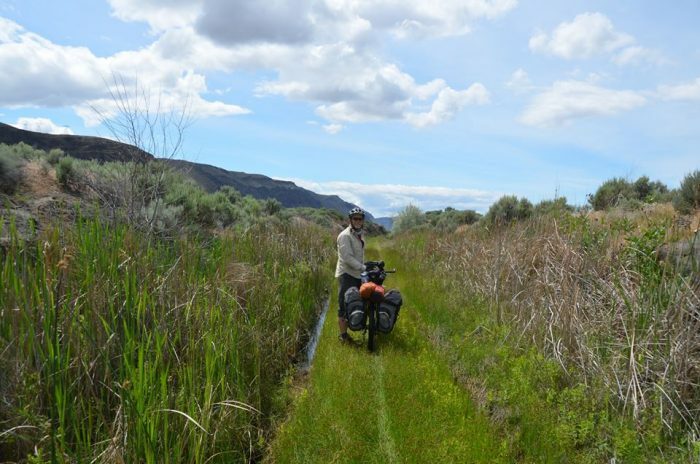 In the fall of 2015, 135 miles of the eastern section of the John Wayne Pioneer Trail was nearly given back to adjacent landowners — saved by a typo in the bill. This secretive attempt by Washington 9th District lawmakers to close the trail created a public outcry that led to three contentious public meetings and a series of Washington State Parks CAMP planning meetings. These meetings started at the beginning of 2016, included meetings for public input and established an ongoing Citizens Advisory Committee with representatives from numerous stakeholders: weed control (important in eastern Washington), bicycling, hiking, equestrian, adjacent landowners, agribusiness, utilities, railroad history and tourism. The final meeting of the Advisory Committee was held in Moses Lake, WA on Monday, June 27, 2016. The proposed final Recommendations Report (a long term plan for the preservation, improvement and maintenance of the JWPT) was presented… but there was additional news! 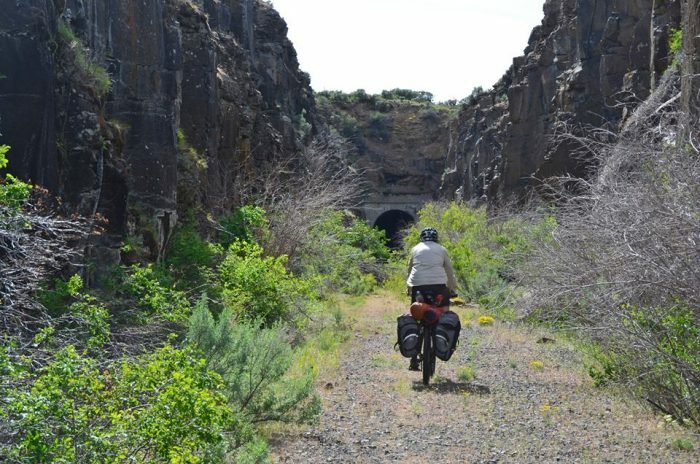 Riding toward the east portal of the Boylston Tunnel in the Yakima Training Center grounds. Photo by Mike Sorensen (used by permission). Now, the potential future closure of the eastern JWPT is unlikely, potential funding for improvements to the eastern section of the JWPT is more likely, and the future of a system of rail-trails in Washington State may be one significant step closer to becoming a reality. In addition to the potential change in policy for the JWPT and Washington rail-trails, Washington Parks is prepared to seek $6.2 million in capital and grant requests for the 2017-2018 biennium and an additional $11.3 million in future biennium requests. These funds will be used for repair and construction of JWPT trestles, bridges, the roadbed, access/camping/water facilities and more. To be clear, these funds are yet to be awarded, but this is truly good news for the citizens of Washington State and for those who have worked so hard to save the JWPT and to bring the promise the JWPT holds to eastern communities like Beverly, Lind, Warden, Malden, Rosalia and Tekoa. 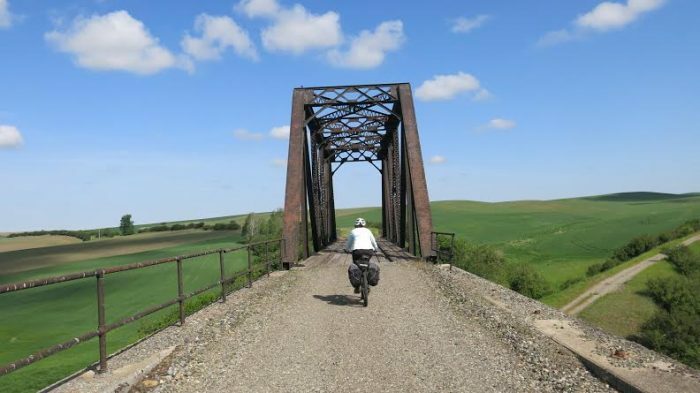 Organizations like JWPT Wagons and Riders, Tekoa Trail and Trestle, Washington Bikes, Washington Trails Association, Cascade Rail Foundation, Pullman Chamber of Commerce and Friends of the JWPT have worked hard with Washington Parks to make this happen. If you live in eastern Washington, or feel like a road trip, the next Washington Parks Commission meeting is July 21, 2016 at 700 Port Drive, Clarkston, WA from 9am – 5pm. The final Recommendation Report will be presented at this meeting. 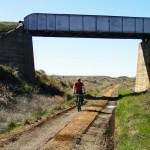 Among the recommendations for the JWPT is the likelihood that the trail name will change. Mike Sorensen on the John Wayne Pioneer Trail near Lower Crab Creek. Photo by Marilyn Hedges (used by permission). If you haven’t done so, put the JWPT on your bucket list to walk, mountain bike or horseback ride. You can get help in planning your trip by visiting the Friends of the John Wayne Pioneer Trail website. Guest blogger Robert Yates serves on the board of Friends of the JWPT, a nonprofit organization. 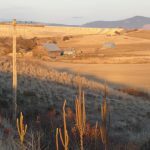 This article was posted in Adventure, Advocacy, Issues & Advocacy, News, Trails and tagged John Wayne Pioneer Trail, trails. Bookmark the permalink. Follow comments with the RSS feed for this post. Both comments and trackbacks are closed.